It is Thursday night, and we, just the two of us, are at the Patriotic Pops celebration, a warm-up concert for the holiday weekend. The night is unseasonably cool, hinting of a storm. We’re sprawled on chairs and picnic blankets across the grass bowl that surrounds an amphitheater, so many of us that there’s no telling, really, where one family ends and the next begins. Adjacent to our encampment are a young couple and their daughter, who is three or four, the age when parents’ shoulders and bellies and knees make the most marvelous jungle gym. She is spilling with laughter that bubbles over the top of her daddy’s head and into the breeze around us. “I think that little girl’s daddy founded Goofball Island, too,” I say, instead of answering the question my daughter has asked. Goofball Island is our new favorite private joke, private because we are keeping Inside Out to ourselves for now, a highlight from the week when my girl had me all to herself, when her brother was still away at camp. I remember the exact moment when I knew I did not ever want to have another baby. We were at a Christmas party, and a friend walked in, carrier in hand, holding her surprise 4th child. I looked at her and felt deep-seated recognition that my world was sufficiently full. Swaddling infants and teetering through toddlerhood were old files, closed to make way for mastering bicycles and cursive handwriting. What my daughter meant with her inquiry, of course, was did I mourn the absence of those earlier moments, their disappearance into the past. These days she is clinically curious about how I feel. Once she was a gigglebox; now she is a microscope, assessing her world in detail. Soon she will be something new again. Each of these iterations is a flavor that I know will, in time, become only a faint aftertaste, if that. How will I explain to her that those slivers of her childhood were like daylily blooms and orgasms and holiday fireworks, not meant to last an eternity or ever repeat in precise duplication. What words will help her understand that my smiling at a stranger’s young child doesn’t mean I would choose those days over these? I wonder if she can know that our long afternoon walks, that listening to her talk about The Mysterious Benedict Society, that picking out rain boots for camp, that every morsel of what is happening now is just as delicious as that four-year-old laughter. 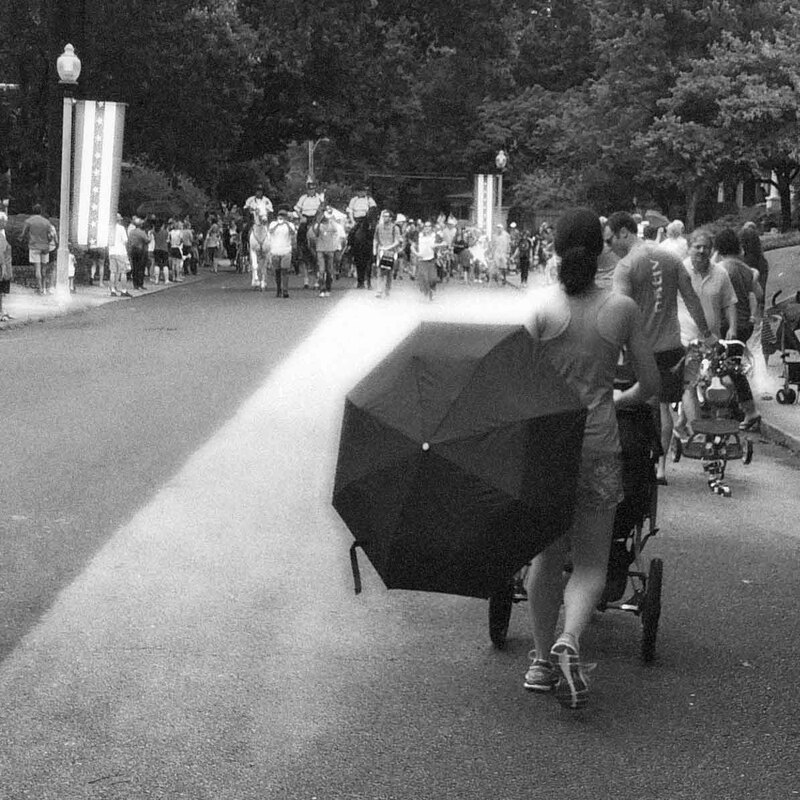 I wonder if she, too, will someday cherish the fleeting impermanence, the trickle of rain seasoning 4th of July parade, the butterflies that stir at the sound of her voice. Amazing. You really had a clear moment when you were like “no more kids” and then never wavered? I’ve had that thought quite a few times, yet somehow keep welcoming kids into our home. True, they are foster kids and so not permanently with us, but still. The clear moment for me was actually no more birthing. No, have never wavered on that! Wow. So touched by this as I contemplate little girls turning five and everyone heading to school and how much of an outrageous punk 8-year-old boys can be and on and on. My husband cried at IO and so did my pediatrician sister, who was sitting next to me. But I couldn’t quite get there. Perhaps I’m avoiding eleven and all that it means. Here you’ve managed to sit in the middle of it all and also to rise above for that bird’s eye view. Thank you. And I just love to savor your comments. I didn’t cry either. It was poignant but not sad to me. Now Flowers for Algernon, on the other hand…. That is my son’s required summer reading which means I am reading it, too. I somehow had never read it before, and I find it impossibly sad. I remember your mentioning it a few months back, and I have been thinking about you as I read…. “How will I explain to her that those slivers of her childhood were like daylily blooms and orgasms and holiday fireworks, not meant to last an eternity or ever repeat in precise duplication.” Gorgeous, delicious, sublime. Oh, to write such beautiful words… love the words you string together, friend. Thanks, Dawn! I hope your baby girl is doing well and ready to welcome one of her own. Thinking about you, and her. Thanks so much Jen! I’m leaving for NYC on Tuesday and will be in Tel Aviv on the 26th… hoping this baby waits for me, but either way I’m excited!! Next article Stardust and princess slippers.